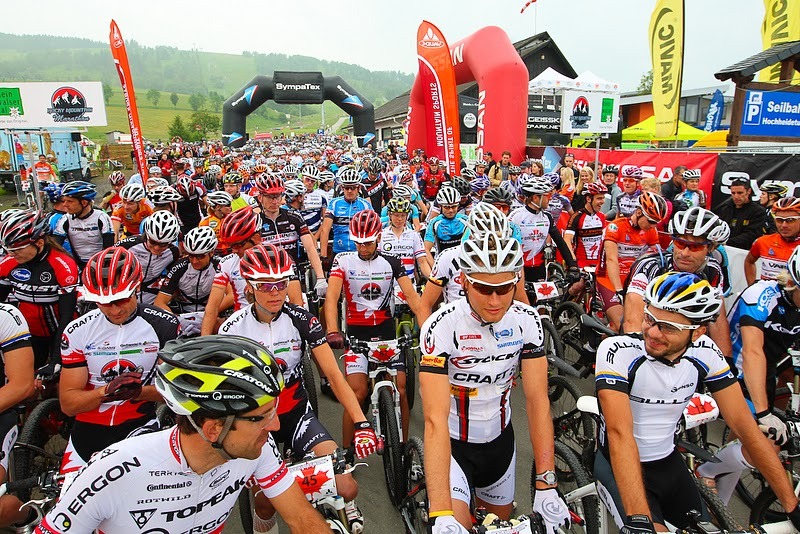 Thursday evening I decided to go to Willingen Bike Festival. Riding my road bike was not painful anymore. How it would be riding my mountain bike was still a big question mark. Only by trying I would find out. Before the start I was very nervous. I did not want to crash. Dealing with another crash would be hard. So I started easy and let Birgit Söllner pass me. I could see her all the time for the next kilometers, but never made the effort to catch her. I was scared in the downhills and always lost a few meters. I also felt a bit weak. The climbs went ok, but still there was a lack of energy. No wonder. It was only one week since my crash and my body has been dealing with the wound and healing it. That takes some energy out of you. At kilometre 30 I spoke with Sally Bigham and told her that the best for me would be to only ride the short distance. Not an easy decision to make. I rode up to Birgit and changed a few words with her. Wished her good luck with the last 2 loops and crossed the finish line. The season is still long and there are many more races coming up. Even if it was hard not continuing the race I think it will bring me more satisfaction in the next races. After the race my calf was hurting a bit due to the vibration I had been dealing with during 50km. A day after the race everything feels good again. I still have to have the stitches for another week. Then finally I will get rid of them and I am sure I will feel more comfortable straight away.